Yesterday morning my beloved popped to the Doctor’s to drop off the test results on his bodily fluids, all negative. However, he saw fit to mention that I was having trouble with my shoulder and returned saying the Doctor was looking forward to seeing me for a spot of acupuncture. I therefore felt obligated to see him too. The shoulder problem started when my beloved omitted to put back in place the dividing curtain in the boot of Tom II. He lets it down to better get his luggage in the boot but then leaves me to struggle to put it back. If I don’t my shopping flies all over the car. It’s tricky because a) it’s heavy, b) I’ve got short arms and c) the bike carrier limits my manoeuvrability. So I strained my rotor cuff which I assumed would get better over time. It hasn’t. I then exacerbated the situation when I landed heavily on my shoulder after tripping up on the pavement in Nice. I had a massive bruise which has since faded. I then fell backwards off the bike onto my shoulder. It’s the net result of these unrelated events which has limited my ability to turn my head to the left (useful for checking traffic), pull on my handlebars when climbing and put my left hand into my cycling jersey’s pockets. As I exited the building to visit the Doctor, I noticed someone had plastered a notice on the glass front door. My immediate thought was “I wonder who’s died?” because this is generally where such information is placed. However, it wasn’t someone. It was eight of the Domaine’s ducks who had been cruelly and carelessly crushed in the past month by, one assumes, cars. I have previously commented on the care I take at this time of year to avoid running into or over our canoodling love birds, or rather love ducks, as they head off into the long grass for a bit of feathered hanky panky. The notice was appealing for witnesses to a particularly wanton incident which occurred in daylight on the hill leading to the Domaine’s entrance. 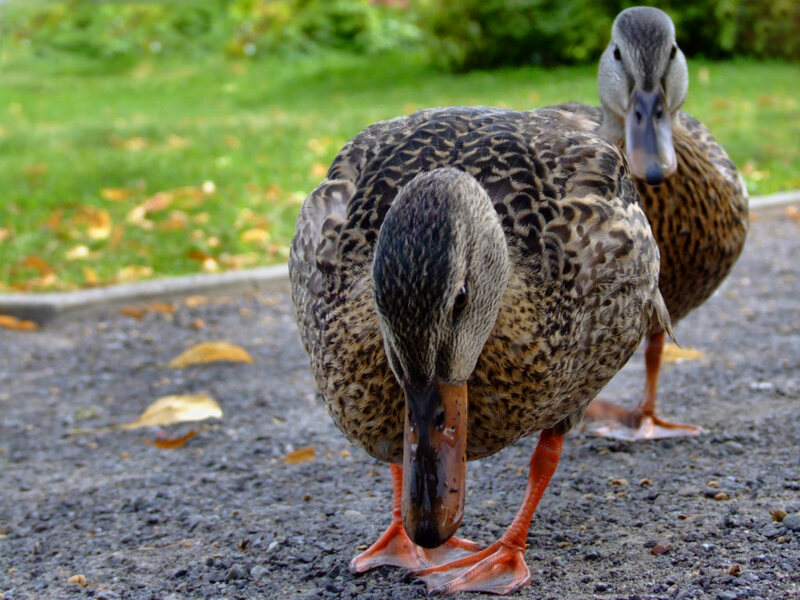 A couple of our feathered friends, on an away day, had waddled under the barrier and down the hill to the kindergarten where they had been crushed to death by a white 4 x 4. Regular readers will know that I recently almost suffered a similar fate involving a similar vehicle. I popped in to see Security and they showed me the grainy pictures of a white 4 x 4 doing a u-turn on the hill. The ducks were found by a traumatised toddler after the car had driven off. I would recognise that car anywhere. Sadly, the close circuit television didn’t extend far enough to reading the car’s registration number which I had memorised during our encounter. I could still remember it and was happy to pass it onto Security. Proving what goes around comes around. I continued on to the Doctor’s which is in the Domaine’s commercial centre. I noted the chainsaw massacre gang was back, stripping bare the lime and olive trees at the Domaine’s entrance. Those boys have been working on and off for about 6 weeks and have only laid bare half the Domaine. The Doctor was expecting me. He took my blood pressure, not sure why, but it was 113/72, which is fine. He then told me I had a frozen shoulder. I amply demonstrated this was not the case with a range of movements (through gritted teeth) which would have impressed the average contortionist. But evidently not the Doctor who proceeded to show me the needles. I averted my gaze. I am not fond of the sight of blood, particularly my own. He stuck needles in my left shoulder, wrist and ear and left them there for 5 minutes. For good measure, he also jabbed me several times with a syringe. He took out the needles and slapped on a magnet. I handed over my carte vitale and some money in exchange for a prescription which I filled in the pharmacy next door. I should add that the Doctor is a well read practitioner, beyond retirement age, who almost exclusively prescribes alternative treatments. Sadly, he could do nothing for the ducks.